It's pretty refreshing to see a record label drop a promo cassette in 2012. Redef Records really knows how to raise the bar on fools. 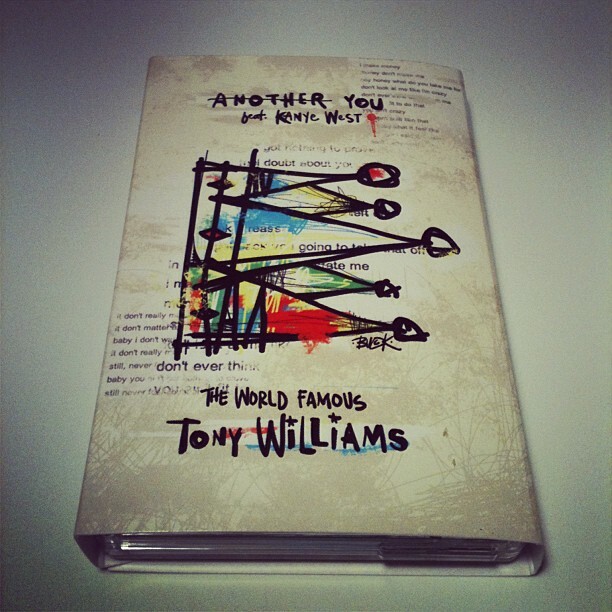 100 copies of this Tony Williams - Another You cassette was made to promote the new 7" and full length album titled "King Or The Fool: An Opera, Volume 1." Some of you may be scratching your heads when you hear the name Tony Williams. For the unfamiliar, please check the the credits on some of Kanye's early albums. Whether you are a Kanye fan or not, there is no doubt that when it's presented by Redef and Joe Buck (on the art tip) you have to stop and check for it. Another classic no doubt! RDF 025 #62 of 100. It’s not what you know, but who you know.” This oft-used adage to describe success in nearly any facet of life is incessantly repeated for a reason: IT’S TRUE. Candidly, this is the common fiber that creates new relationships and provides an opportunity for the “knowns” while frequently relegating the “unknowns” to the back of the bin. Another vital component is talent – a necessary ingredient in any burgeoning career and a perquisite for sustainability. Enter “The World Famous” Tony Williams, a performer that not only features Kanye West on his latest 7” single “Another You” but can call him family as well. Sure, the familial bond is important, but let’s be real: Mr. West is not co-signing ANYONE on his solo albums (Tony has been on EVERY one) unless you can stand on your own merit, your own talent. Tony Williams performed at not one, but two different Inaugural Balls in 2008. Having a famous cousin can get you in the door, but performing in front of the President (twice) takes more than fame, game or name. Keep in mind: this is Tony Williams’ project and Kanye West is a guest rapping on it, a la College Dropout-era with soulful production provided by BINK!. The singing meshes seamlessly with the soundscape and you can feel the honesty in the creation of this song. It feels as if Tony and Kanye were at a family function and they took a break to hit the studio and this gem was the result. Redefinition Records (REDEF) saw the sincerity in this project, too, and is not only offering this song in a 7” format, but a CD of Tony Williams full-length King Or The Fool: An Opera, Volume 1will be included for fans looking for physical product. Joe Buck provided the stellar artwork to go along with features from John Legend, Raheem DeVaughn and production by BINK!, No I.D., Hit-Boy and others. This teaming up of REDEF and The High Society highlights the desire to give fans something more than another free download of disposable music to be lost in the iTunes abyss. Attention is given to the music, the lyrics, the artwork and the packaging. “Another You” is representative of an album oozing with effort and a passion for this artform, which connects Tony Williams and the listener. Plus, enjoy a slice of history as this is the first 7” for either Tony Williams or Kanye West in their distinguished careers. It’s a family affair! ENJOY. Can the tape be purchased or it's given away for free to promote? I'm assuming it's a give-away cause the site doesn't show the tape available. The tape was given out as a promotion for the CD/LP. Make sure you follow Redef Records so you can keep up with their releases. They do cassette releases every so often. Ya, it's time I sign up over there. Thanks for the head's up BP!